iSync for Mac has been updated by Nokia. It now supports the new N8. Using iSync, you are able to keep on top of your calendar easily by synchronising meetings and appointments between your Nokia device and iCal, Apple’s handy desktop calendar. You can also use iSync to synchronise contact information between your Nokia device and your Mac’s Address Book, including: phone numbers, addresses, email addresses, web addresses, photos. You can follow these steps to download and install the plugin. 1. Run Apple Software Update to make sure you have the latest version of iSync. The minimum requirements to use the plugin are Mac OS X 10.4.9 and iSync version 2.4. 2. Download the plugin from the link next to your Nokia device model. After you accept the licence agreement the download starts. 3. Make sure iSync is not running. 4. Double-click the downloaded plugin disk image to open it in Finder. 5. Double-click the installer package. This will have a file name ending in ".pkg". 6. When the installation is complete, drag the disk image file to the Trash to eject it. 7. Start iSync from the Applications folder. 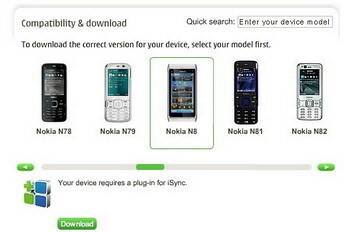 iSync is compatible with the Nokia devices listed on this page. iSync needs a plugin to work with some of these devices: this is a small piece of free software that you can download and install yourself. 0 comments on "iSync for Mac updated with Nokia N8 support"